THE BRISTOL STREET ART EXPERIENCE is our most popular activity, combining our award-winning BANKSY inspired BRISTOL STREET ART TOUR with a #SPRAYSTREETART stencil art spray session, creating the perfect balance of education and enjoyment for young people. This amazing experience in the city centre of Bristol is now enjoyed by 100’s & 100’s of young people each year. It’s a chance to hear about Bristol’s unique history into creativity, the stories of BANKSY and other artists, plus each student will spray their own artwork souvenir to take home using our laser-cut stencils and water-based spray paints. EACH PERSON CREATES SOUVENIR ARTWORK TO TAKE HOME (59cm by 42cm) AND ENJOYS A BRISTOL STREET ART TOUR! 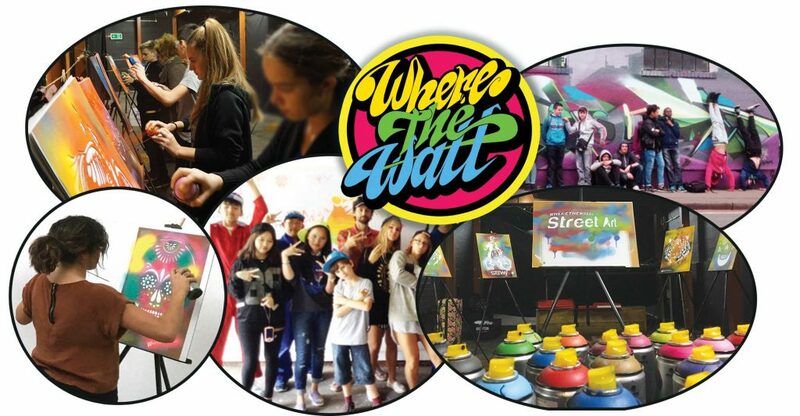 “We had a fantastic time thanks to WhereTheWall! 45 french students, 4 teachers divided in 2 groups. and the other one was with Rob for a Street Art stencil session. The kids all left with their own painting to take back home. and Brighton! Highly recommend this to me fellow teachers! We also offer the BRISTOL STREET ART Tour which is a 2 hour walking tour discovering over 30 years of Bristol street art and graffiti art history. From Banksy art, to graffiti art & international street art this fascinating guided walk uncovers the stories from the streets of this unique city. A chance to experience Bristol street art and hear the amazing stories behind this unique city, with insights into the life and work of Banksy, and photos of street art by international street artists. Also a visit to the cultural quarter where the street art and graffiti is unique and special. Discovering why Bristol is the street art and graffiti capital of the UK. Street Art Tour & Stencilling (”The Bristol Street Art Experience”) on Tuesday. The guides & tuition were excellent. We learnt a great deal. opened their eyes to what was out there. It has hopefully encouraged them to be more observant! They loved the stencilling & came away with some beautiful art work. We work closely with a number of international schools providing Bristol Street Art Tours. Many UK schools now cover Banksy and street art on their curriculum from maths to geography, history to art. WHERETHEWALL discussing each unique requirement with the school and customised the tour the focus on the areas that the group have been studying. Often WHERETHEWALL gets asked to for private tours that allow a group of friends to enjoy Bristol street art at a pace that suits them. This is usually outside the scheduled times of the tour. WHERETHEWALL is always willing to make these tours. We have worked with tour operators to provide a unique cultural experience for visiting tour groups. All of our experiences are offered in English & French. or email: bookings[at]wherethewall.com to discuss your unique requirement . For one of our client specialists to get in touch with you personally, please enter your name, email address and optional message below. We will contact you shortly.